This environment is called as a Client/ Server Architecture. Servers are heavily loaded/ traffic, long queues there by reducing the performance of the servers. There is no queuing mechanism and only server queues are maintained. Server needs to process the request (Understanding the user language). Interpretation takes time. These are the disadvantages of R/2 Systems. There is no queue mechanism to handle the requests there by servers are heavily loaded. 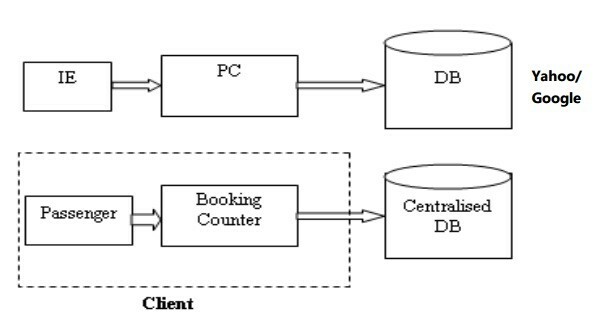 There is a queue mechanism to handle the request there by reducing the load on the client and server. User requests are served based on the FIFO using dispatcher. Work process task handlers are used to interpret and process the request. Intermediate buffers are available for the frequently accessed content to reduce the load on the Database server. The server side processing is only takes place for new requests there by server resources are optimally used. It is the Intermediate layer in between the Client and the Server. It is installed with a database client to communicate with the database server i.e. all the clients are freed with DB Clients. Application server/ layer handle the request and process them based on FIFO (First in and First out). It has its own queue mechanism to process the user request. It also contains the task interpreters to interpret the user request and route it to the server. It is intelligent to store the frequently accessed data thereby reducing the load on the server. It is used to handle the user request and process them to the database. It has dispatcher to process and monitor the user request, work process to process and interpret the requests, Buffer areas to store the frequently accessed data. It absorbs the load both from Client and the server. It is the area where the complete data resides. It has its own queue, process, buffers, and request handling mechanism. Most of the databases are on Oracle. SAPis pushing MAXDB (without any license key), Microsoft SQL Server & IBM DB2 with discounted prizes. SAP is focusing SMB (Small Mid-sized Business) and promoting SAP for nearly 1 million/ Rs. 10 Lakhs/ per customer.